Here in this article, I will explain you to publish your app to the Amazon App Store. Here I am publishing my own Android app to the Amazon App Store. In this guide, I have covered all the essential steps to follow to publish your app on the Amazon App Store. Step 1: Go to this link and create your Amazon developer account. Here it is necessary to configure payment option during the creation of the account. 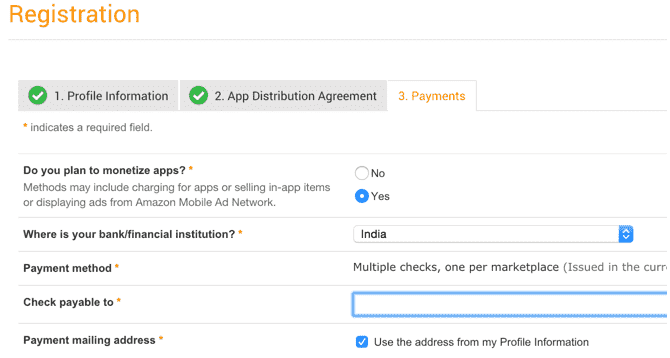 If you are offering in-app purchases or you want to monetize their app using Amazon App Store then this is especially important. Step 3: Click on Apps & Services. Step 4: Click on Add New App. Step 5: Select Android Platform and go to next page. Step 6: After adding the details you can Click on “Save”. Now click on all the tabs above and add the details. Next, all steps are very easy and they ask you to provide details about your app and about the developer. or 2560 x 1600px (portrait or landscape). Promotional image 1024 x 500px (landscape only) PNG or JPG. Step 7: Now click on “Save” and click on each tab and add details. Here you can to upload the .apk file under the binary files tab. Step 8: Once all tabs are green ticked, click on “submit app” under “app name” to submit for review. Note: According to the official help page, they take one week to review your submitted Android app. To create an Amazon developer account is free. The Amazon App Store accepts non-exclusive app submissions.